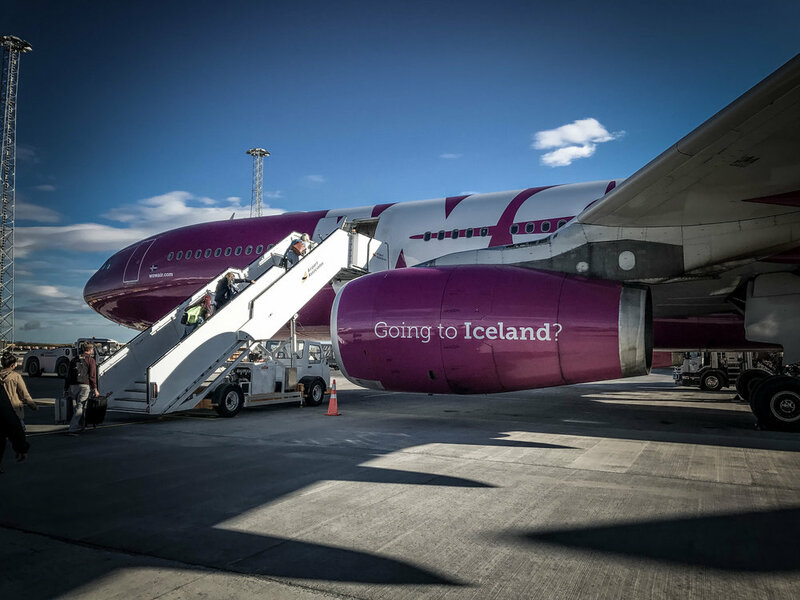 Sitting in the waiting area at the airport heading back to LAX, I was already planning a return trip to Iceland next spring. My UK friend, Chris Modell, and I met five days earlier at the baggage claim at Keflavik International Airport outside the capital city of Reykjavik. 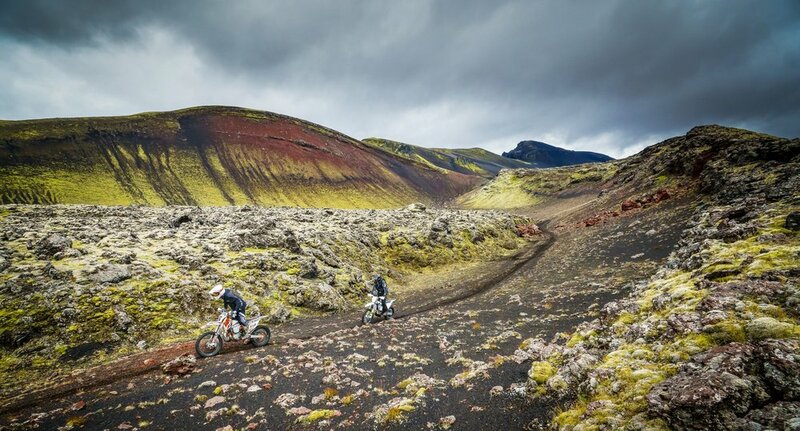 A few months prior we had connected with Gunnlauger “Gulli” Karlsson on Facebook and arranged a visit to ride dual-sports on this island known for its lava fields, volcanic mountains, and glaciers. 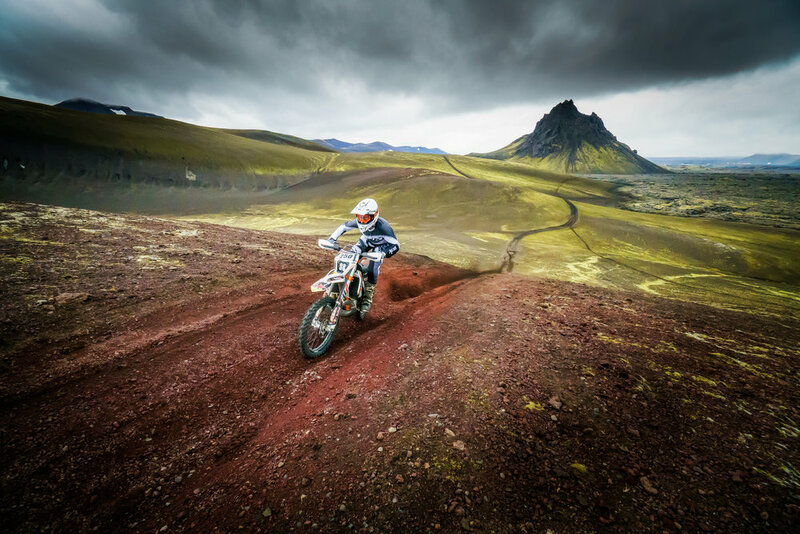 Gulli is an ex-moto racer and former Icelandic MX champion, and was on the Motocross of Nations team in 2009. He now runs a successful graphics and printing company and still races, occasionally. 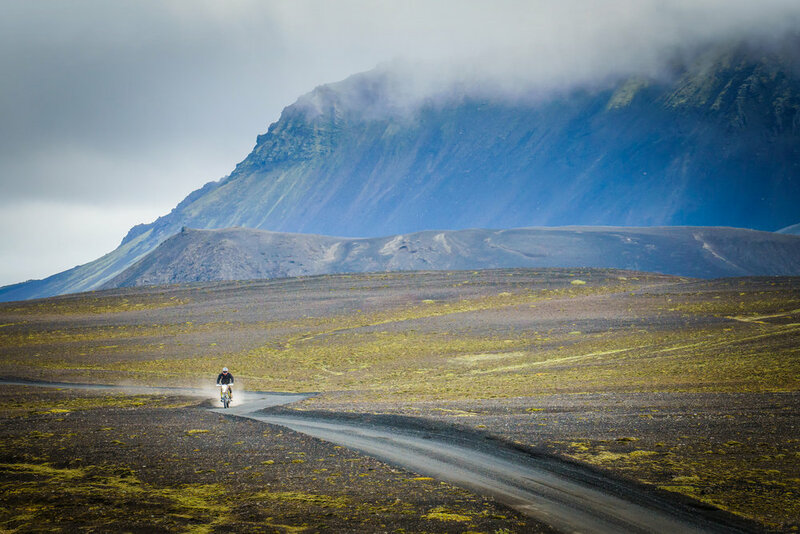 On our first day of riding we were to meet the guys from the tour company Ride With Locals in the small town of Selfoss, about an hour from Reykjavik. We met up with Gisli and Gudjon, and headed north to the trailhead. Over our Cardo intercoms, Chris and I re-named our trail bosses G1 and G2 as we were struggling with their names initially. 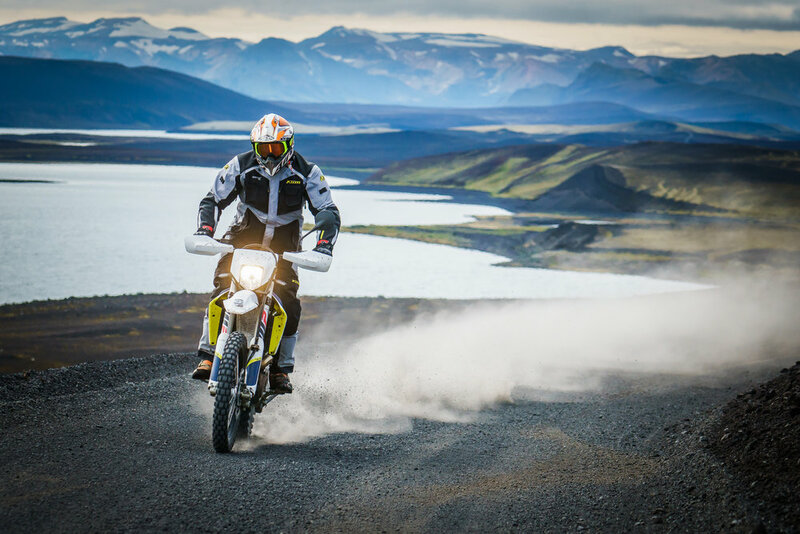 The bike of choice on the Ride With Locals tour is the Husqvarna 701 Enduro. The big Husky Enduro turned out to be the perfect bike for the day’s trails, as we had some 20km sections of asphalt, and fast two track and “F” roads. 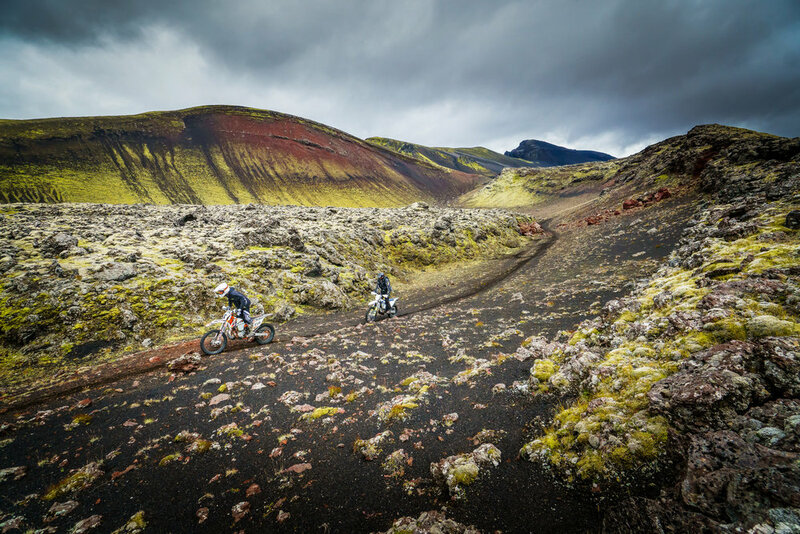 The “F” designation basically means you need a 4x4 to traverse the roads, as they are completely made up of gravel, volcanic sand, dirt, and rocks. Trying to concentrate on the trails was pretty tough as every hill we crested opened up to another unreal vista. 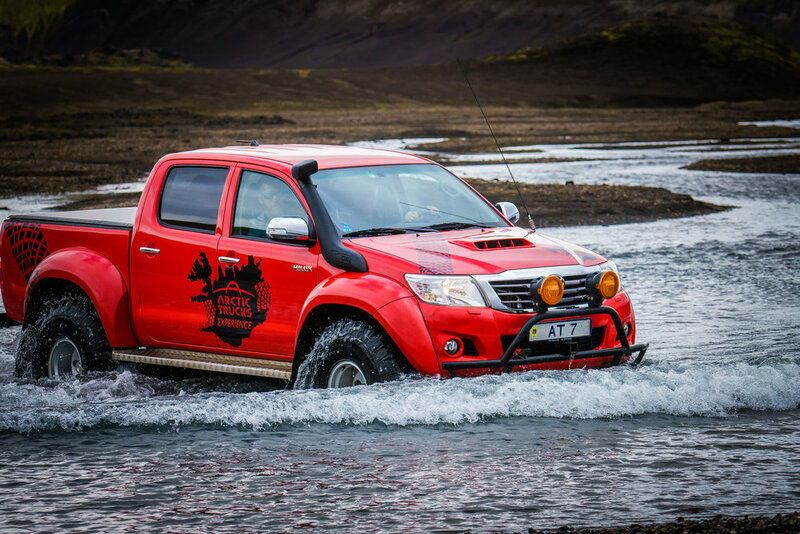 And then it happened: our first legit Iceland water crossing. The river was about 75 feet wide and running pretty fast. My first attempt was a big success (meaning I didn’t dunk myself or the bike) and when I reached the other side, I broke out the camera to get some shots of Chris and G1 crossing. After Chris completed his perfect crossing, he suggested, “Let me get some shots of you now.” I crossed back over and on the way back across for my photo shoot, I put my foot down into the 2 foot deep icy water and managed to slip over and drop the 701 on its side. I slipped again trying to pick up the big Husky, but by now G1 and G2 were running in to help get the bike up and keep the air filter dry. We were lucky this time that no water got through the filter into the motor, but as I re-started the bike a full stream of river water blasted out of the silencer. A few seconds later, we were on the trail again heading to the next challenge. The next crossing was much wider and the water was not running fast at all, so no problems on this one. The highlight of the day, apart from the great scenery and trails, was the Landmanna-laugar hot springs. The parking area was quite busy, and luckily we had packed bathing suits with us. Well, some of us did. I was running board shorts, Chris had the standard UK Speedo, and Gisli just went full commando into the river. Quite a few ladies in the area are now ruined as Gisli is straight out of one of those Netflix Viking shows. We pushed our fuel range to the absolute limit on our 701s and our fuel lights came on about 30km from our parking spot. I was drafting Chris on the pavement back to the trucks and we all made it with drops of fuel to spare. By now darkness was falling and the rain and fog rolled in for our long drive back to Reykjavik. Our timing for the trip was unlucky as the weather for the weekend looked pretty bad. We spent our second day exploring the town in our Klim rain jackets and crossed our fingers for better weather the next day. “It’s looking good!” said Karl, Gulli’s father, who owns a KTM and Husqvarna dealership next door to Gulli’s print shop. We loaded up the bikes in Karl’s big KTM Sprinter and drove back out to the wilderness for another day of breathtaking scenery. Although it was not raining, the threat was there, and Karl is an expert at reading the weather systems in this area. We parked at the trailhead for Hekla volcano and unloaded our four bikes. Chris and I were on Husqvarna 450 bikes, and both Karl and Gulli were on KTM 250 2-strokes. We knew these guys were going to be good, but wow! They both were ripping giant wheelies as Chris and I watched and captured the fun on our GoPros. Shooting images on this trip was proving to be difficult for me as I felt the immense landscape laid out before us could not be accurately captured on a small camera chip. Moving through the hills and valleys we were once again in awe of this huge expanse. 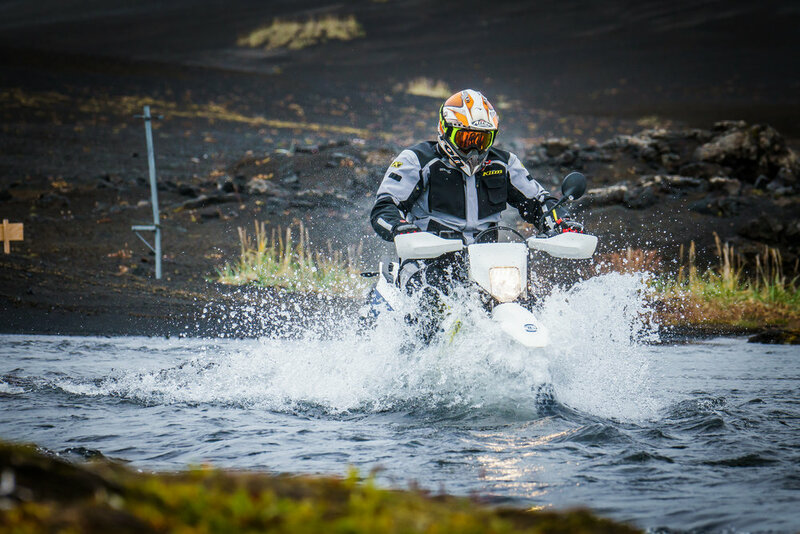 River crossings and huge moss-covered lava fields kept us busy for hours shooting photos and riding in the largely deserted area. We only saw a few 4x4s and no other motos all day. “It is forecast to rain at 5pm,” Karl announced. As we arrived back at our starting point at a few minutes to 5, the rain clouds rolled in on cue and it started to drizzle. We were happy to load up as we were in visual stimulation overload from the day’s riding. On our last day, Gulli took us on some rocky trails behind the local motocross track. This area can be described in one word: Rocks. Everywhere. Both Chris and I struggled on this surface as it was much more technical than the previous day’s relatively smooth “F” 4x4 roads. Rain stopped play again and we rinsed the bikes off at the track and made the journey back to town. 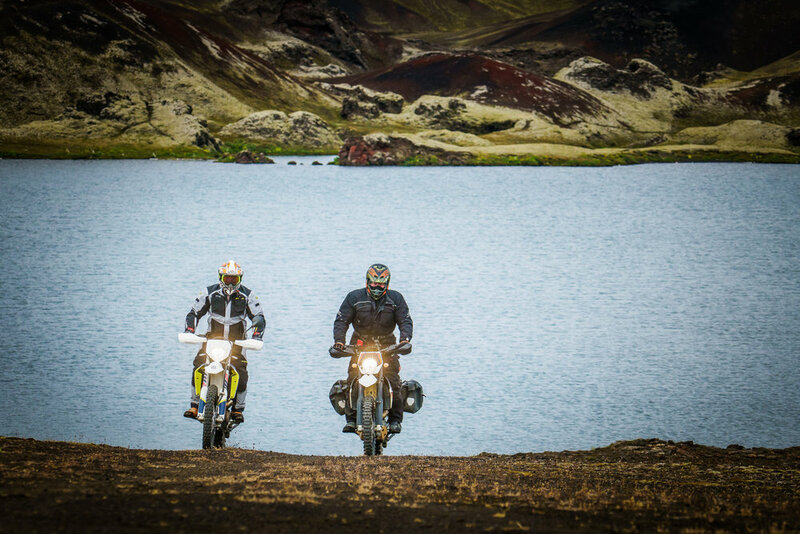 Our trip to Iceland was just incredible and we barely scratched the surface of what there is to see and ride. There are several ADV tour companies on the island, but they stick mainly to the asphalt. 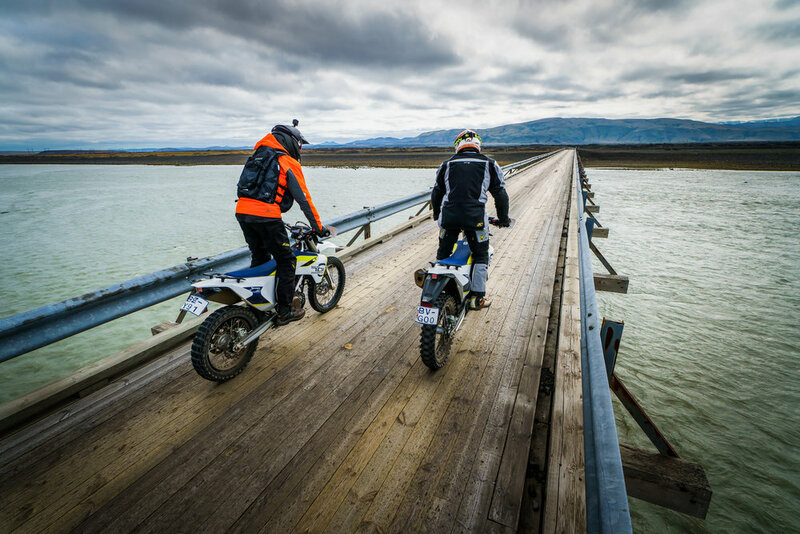 For the real deal off-road experience, the Ride With Locals set-up is the way to go on their fleet of Husqvarna 701 bikes. 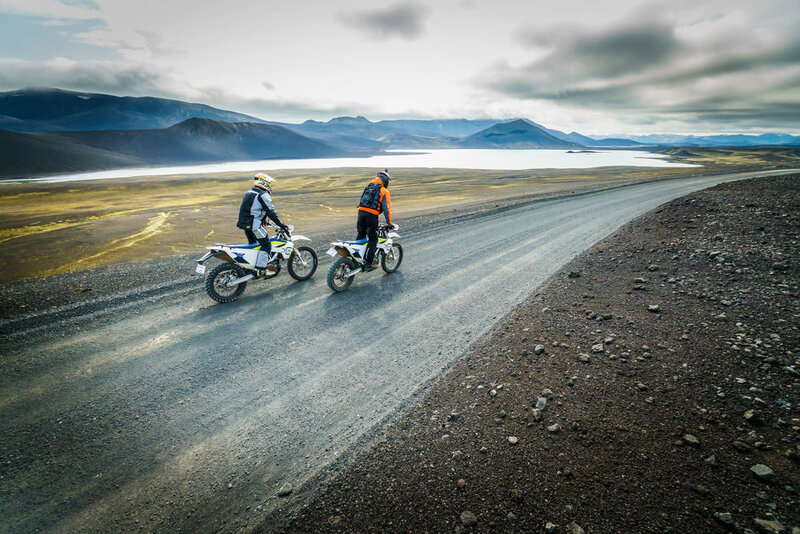 These big Enduro bikes are fully capable of handling Iceland’s “F” roads at a good pace, and with the team of Gisli and Gudjon guiding the way there are limitless places to explore.